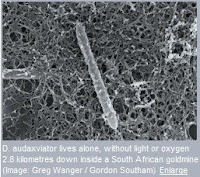 A bug discovered deep in a goldmine and nicknamed "the bold traveller" has got astrobiologists buzzing with excitement. Its unique ability to live in complete isolation of any other living species suggests it could be the key to life on other planets. Dylan Chivian of the Lawrence Berkeley National Laboratory, California, studied the genes found in samples of the fluid to identify the organisms living within it, expecting to find a mix of species. Instead, he found that 99.9% of the DNA belonged to one bacterium, a new species. The remaining DNA was contamination from the mine and the laboratory. "The fact that the community contains only one species stands one of the basic tenets of microbial ecology on its head," says Carl Pilcher, director of the NASA Astrobiology Institute, who was not involved in Chivian's DNA analysis but whose team made the initial discovery that there were microbes living in this particular fissure two years ago.